Returning to work but want something that will fit in with the kids? This could be just the chance you’ve been waiting for. If you’re a mum looking to get back into the workforce, it can be hard to know where to start. Finding a role that meets your requirements, both personal and financial, and fit in with the juggle that comes with being a working mum might seem impossible. Fortunately, the introduction of the National Disability Insurance Scheme (NDIS) by the government in 2013 has meant a dramatic increase in the demand for a particular type of employment that may just tick all the boxes for working mums. The scheme enables Australians with disability to access a variety of support services, including the aid of care workers. And it’s this important role that many mothers across the country are now finding offers the magic combination of being both rewarding and flexible at the same time. Michelle Cox from Chadstone, Victoria, is 43 and mum to one-year-old, Murphy. 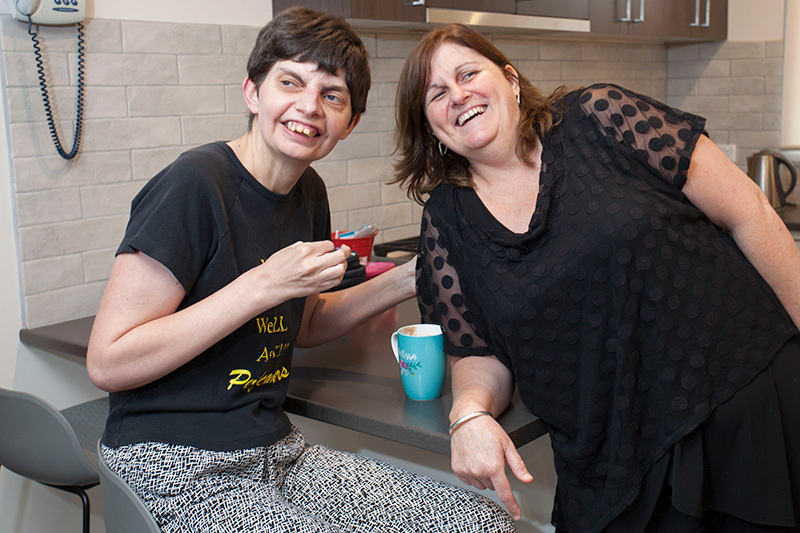 Michelle recently switched from her job in IT to a new career as a disability support worker. Despite having no experience as a carer (“apart from being a mum which has come in very handy in terms of some of the skills I need”), Michelle says the four-day intensive training course she undertook with her new employer ONCALL put her in good stead for her new role. “It’s more about being a caring person who can learn on the job and use common sense and compassion – qualities which most mums have in abundance,” she explains. Michelle also likes the variety of being a disability support worker. “No two days are the same. It’s been a steep learning curve and it has challenged me but in a good way,” she says. The truth is, motherhood develops not only practical skills but also abilities which are highly sought after by employers including multi-tasking, collaborating, delegating and people-managing. As mums, we recognise our worth as employees with almost 70 percent of us believing that the skills we’ve learnt as a mum make us more employable and better at our jobs. But of course, the trick is finding an employer with the same insight and who will harness those skills in a career that works on all levels for mums – and their many commitments. For Michelle, that career is proving to be a caring one.